The 'Jardin des Tuileries' is the garden that sits between the Louvre Museum and the 'Place de la Concorde' - you can see the Conncorde's Carrousel in the middle of the picture. 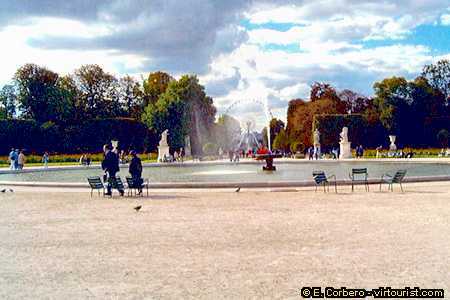 In 1559 Catherine de Médicis, Henry the Second's widow, commissioned the construction of the palace of Tuileries close to an Italian garden. The layout of the garden underwent many changes until 1660, when Le Notre designed the current park.